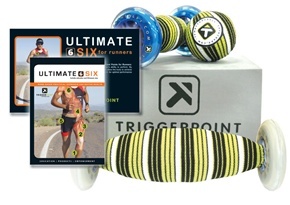 After the magic that is the TriggerPoint Systems The Grid foam roller (profiled here) I was thrilled to test the other products they offer, specifically the Ultimate 6 Kit which includes the Footballer, Massage Ball & Block, the Quadballer and the book/DVD instruction set. Further, these products easily fit in my suitcase for travel where The Grid does not. The book and videos do a great job of explaining how to use the products and while geared primarily for runners, I found them very helpful. I also got TPT’s new Upper Body guide which illustrates pressure points and therapy techniques targeted for specific problem areas. So far I’ve used the U6 Kit to work out kinks in my calves and neck and really love the massage ball’s effect on my chest/shoulder. This is truly one of those product sets where the saying “no pain, no gain” isn’t a cliche…breaking down scar tissue takes patience, breath, and persistence, but used in conjunction with other rehab techniques and tools, it’s awesome. The U6 kit is $140 and available here.